Spring is round the corner and it’s time to turn some heads right to your front door with a spring-perfect wreath grabbing its well-deserved spot. Here are 25 gorgeous spring wreath ideas that would make constructing a wreath at home oh so easy that going for a store-bought one would seem totally ditchable. The huge spectrum of hues that tulips come in allows you to make a lovely tulip wreath that’s not only rich and luscious, but matches the overall decor of your space just right. A subtle white-and-pink wreath keeps everything low-key, the pink-purple one sports a lot more vibrance, whereas a super soft scheme is flaunted by a white-peach-and-cream combo. The base for the wreaths is a foam wreath covered throughout by satin ribbon in a coordinating shade, lastly, adorned with bunches of silk tulips. The flowers are actually wrapped and tucked into the ribbon that itself is hot glued to the foam base. Whether faux or natural hydrangea blooms in different colors will add spring cheers to the front door almost effortlessly. The other supplies you are going to need to get started with the process is a 10 or 12 inch wire wreath form, wire clippers, and some florist wire. The key is wrap the paddle wire around a tiny section of the wreath, further placing one hydrangea bunch on the wrapped part, securing it with the wire. Simply keep repeating the same until you cover the whole wreath with pretty flowers, getting vivid with the color combinations to make it even more visually appealing. Learn what to do next in the below guide. Combining the pastel hues of spring with all rustic elements is going to instantly catch everyone’s eyes. Just like this beautiful do-it-yourself wreath that for a large portion of itself, reveals the grapevine wreath that it’s put together with. The baby pink and bright white florals adopted on this wreath look oh so amazing with loads of natural branches taking up the place. While the whole decorative part is assembled on only one side of the wreath, a large burlap ribbon bow placed in the middle of the floral branches completes the rusticness. The picture itself speaks for itself, calling for no tutorial to get it done. Here’s a super easy spring wreath that keeps the whole process limited to no more than 5 minutes of your precious time. 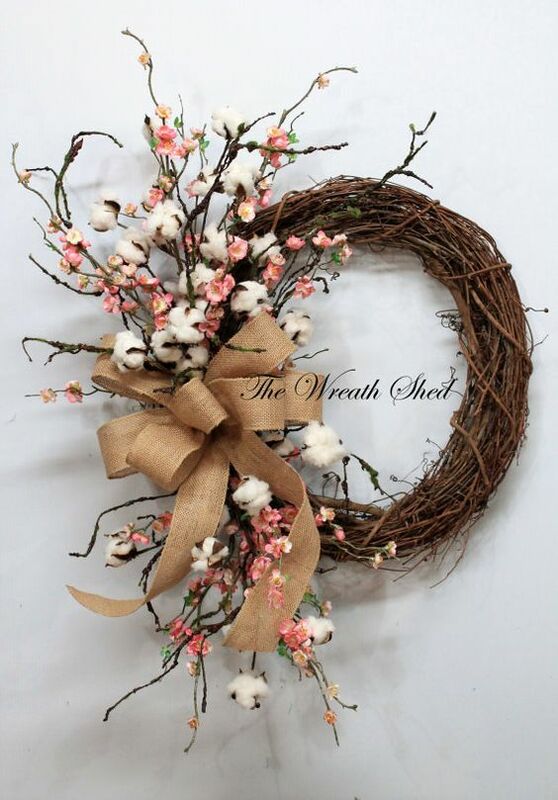 Perfect for the last-minute procrastinators, the wreath is just a matter of 10 dollars, featuring fresh and bright that are complemented by the lovely blossoms in pink and white. You are going to need a grapevine wreath, a pink blossom vine, white blossom stems, a hot glue gun and some craft paint of your choice to work up the wreath. The final touches here are added by a wonderful 3-dimensional Welcome sign that’s placed around the bottom of the wreath, coated in a bright yellow. What makes this one-of-a-kind wreath stand out is the super large size of the flowers it’s worked up with. A specific number of 9 hydrangeas gets the magic going, having the stems of each of the flowers removed before attaching them to a lovely 18 inch wire wreath from the stores. The only other supply you need to gather to build the wreath is some floral wire in order to connect the faux hydrangeas in pastel shades of blue, white and pink to the wireframe. This inspiration by Artsy Chicks Rule places the wreath on a large mirror indoors, the porch window, as well as the front door in the most stunning ways. You would totally fall for this spring wreath that revolves around glorious pinky-orange tulip flowers, all covering a rustic grapevine wreath in half. Because grapevine wreaths can stay on the door round the year, simply letting you customize them with different decorative elements as the seasons come and go. To make this one, you will need some bunches of large tulips, some burlap or ribbon, and a monogram letter that will work as a great accent to the finished piece. Once you figure out how you are going to place your flowers on the wreath, you weave the stems into the grapevine, finally decorating with a burlap bow. Spring, and the glamorous natural colors it brings into the surroundings makes the coming of beautiful butterflies into the gardens a must. So why not bring those beauties into the decor as well? A group of butterflies called as a kaleidoscope seems to have found a new home in this DIY wreath. Actually, they are readily available butterfly images that have been printed on both the sides of a piece of cardstock. You cut each of the butterflies out and coat them with a thin layer of white paint for extra finesse, finally gluing them around the grapevine wreath. As delicate and adorable to look at as a little baby, this wreath has rightly been named as Baby’s Breath Wreath because of the flowers it puts to great use. To build the same right from the very scratch, you are going to need a styrofoam wreath form, a thin wire or floral wire, a ribbon for hanging your wreath, and snippers for snipping. Even Baby’s Breath are used in two different varieties in the idea shared by Two Delighted. While one has tiny little flower heads and is more green, the other one comes with big, fluffy flower heads. A careful twisting and wrapping of the flower stems is the key! Select all kinds of yellow pretties that you find out there, whether faux or real – and get going to turn them into this monochromatic spring wreath that is all about freshness. Speaking of the steps, this one is all about getting a twig wreath and hot gluing the flowers to the same, bringing a stunning element of spring to your front door. To hang the wreath, you can use a large burlap ribbon, looping it around the wreath and hanging it on the door. For further instructions, head to the below guide by Colors and Craft, building your own versions to the spring goodness. You don’t always need to stick to flowers to make the front door scream spring out loud. Something as earthy as burlap can come equally handy to make a unique spring wreath, while a few felt flowers add the much needed element of color and vibrance to the assembly. You are going to need a 14” foam wreath form, lots of burlap, some pearl headed pins, colored sheets of felt, a ribbon, and a hot glue gun. That fluffy burlap part throughout the wreath is actually, different-sized squares of burlap that are folded in a specific manner and placed into the wreath with pearl headed pins. The felt flowers call for a little crafting as explained by Mom it Forward. We simply can’t get over this clever blend of violet, lavender, white and touches of spring green that’s flaunted by this berry wreath. The list of supplies includes a wreath form, berry sprigs in your choice of colors, a hot glue gun and some glue sticks, and a pair of scissors. The berry bunches are pulled off from their stems and adhered to the wreath using a hot glue. The below guide by That’s What Che Said offers detailed, visual instructions for making a this show-stopping one of a wreath with great ease. An undoubted focal point of the space where it’s placed! Express your love for tulips in a full fledged way by letting the front door do the task. And this homemade tulip wreath is surely going to come handy in getting that done. To begin, all you need is a grapevine wreath, about 20 tulip stems from any local craft store, some wire cutters, sole burlap ribbon in 2 different widths, a floral wire, and a hot glue gun with glue sticks. Even that burlap bow on top is a richer version of a regular bow as it comes with four large loops to form the finished bow. The flowers are placed at strategic positions to reveal the grapevine wreath in style.